The Quality Efficiency Deficit (QED) chart is found on the opportunity scanner page. 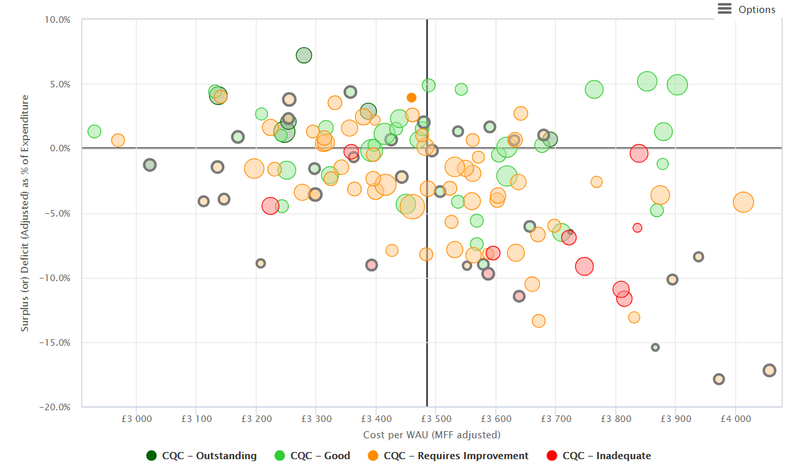 It shows the correlation between financial sustainability (overall surplus/deficit), efficiency (cost per WAU), clinical output (number of WAUs) and quality (CQC rating). This enables trusts to view their performance across all four of these key areas, against their peers, and consider the relationship between them. Data on overall cost per WAU and clinical output in WAUs is derived from reference costs. Data on surplus/deficit is derived from trust consolidated annual accounts. Data on CQC rating is derived from the CQC Care Directory. Data on monthly expenditure is derived from providers’ monthly in-year monitoring returns. The Quality Efficiency Deficit (QED) enables trusts to quickly and easily view your relative performance across four key metrics. The multi-dimensional bubble chart gives a composite picture of performance across the non-specialist acute sector. Your trust is shown as a bubble filled with a solid colour. When you select a peer group, the bubbles representing your peer trusts are circled with a bold grey line. *The QED chart uses an adjusted figure for surplus or deficit as % of expenditure. It has been adjusted for an equivalent comparison between foundation trusts and NHS trusts. This means that trusts in the upper left quadrant are those that have more sustainable finances and are more efficient (lower cost per WAU). Those trusts in the bottom right quadrant have less sustainable finances and are less efficient (higher cost per WAU). Trusts in each CQC rating category can be hidden or displayed by clicking on the appropriate button in the legend under the chart.